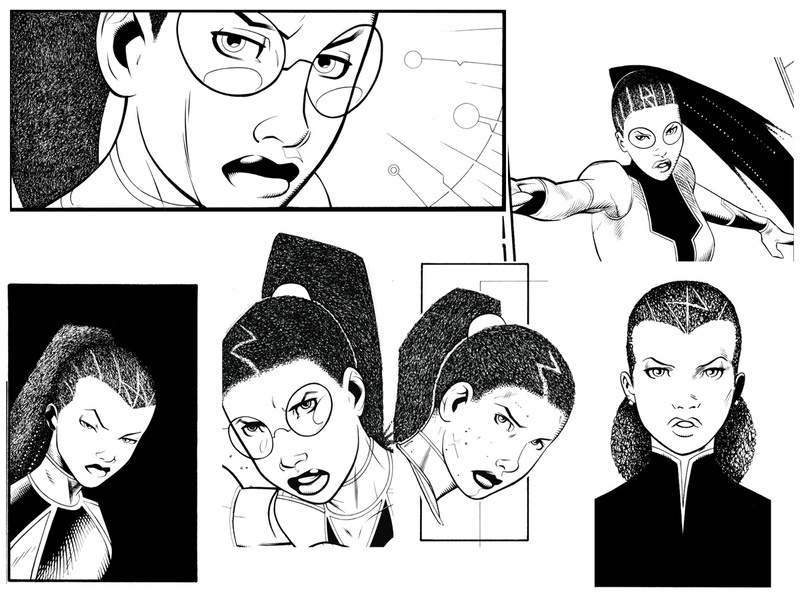 The nominees for the 2012 Glyph Awards — honoring the best comics by and about African Americans, have been announced, and I’m excited to share the news that Miranda Mercury scored four mentions in the following categories- Story of the Year, Best Writer, Best Artist, and Best Female Character. Congrats to our fellow nominees and my creative team as Miranda continues to build momentum months after the book’s release. More to come and our girl is in great company this year. Full list of nominations is below. Luke Cage, Thunderbolts, Jeff Parker, writer, Declan Shalvey & Kev Walker, artists; created by Archie Goodwin & John Romita Sr.
Been a busy few weeks around Miranda Mercury Central, with the biggest news being the book’s recognition by the Young Adult Library Services Association (YALSA), placing on their 2012 Great Graphic Novels for Teens List. Huge, huge honor for the entire team, and a great way to kickstart the year. 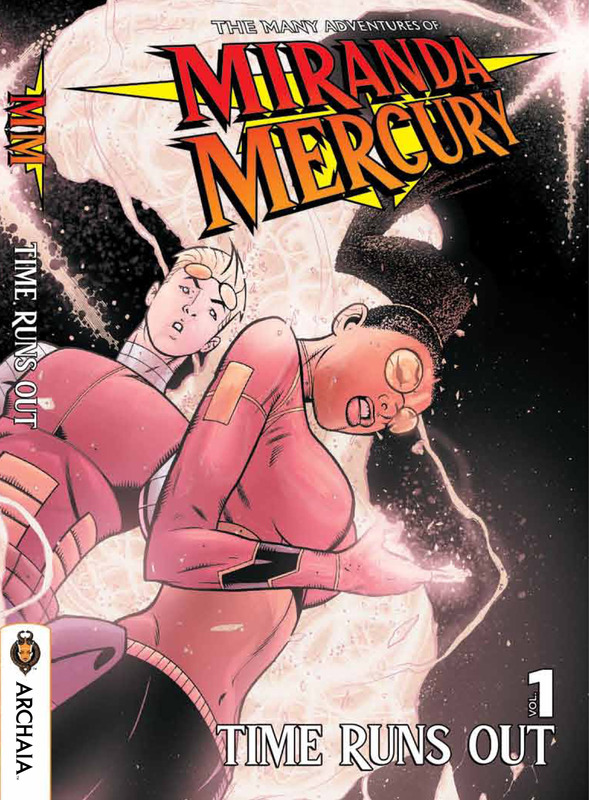 In addition, the book was spotlighted as “one of the best OGNs for 2011” by CBR’s Greg Burgas, and appears on Library Journal’s list of 25 Graphic Novels for Black History Month. Do you have your copy yet…? It’s come to our attention that some people still haven’t received their copies of the book from Amazon, despite having logged pre-orders months ago. It appears that awhile back, when Amazon realized that the release date for the book would be closer to August 31st, and not September 13th as their original listing indicated, they scrapped the entire listing and re-built it from scratch, instead of simply changing the release date. This means that if you pre-ordered the book using that initial listing, your order has likely been trapped somewhere in Amazon limbo and is attached to a “product” that no longer exists. So if you did pre-order the book and still haven’t received it yet, there’s a good chance this is what happened to your order. Here’s what you do though—sign into your Amazon account, cancel your original order and then re-order the book through the current listing. There’s still about 20 copies in stock, so hopefully this glitch hasn’t effected too many people. If you’re still having problems finding the book, please drop me a line at thefictionhouse@gmail.com and I can help get you in contact with an LCS, who can also get you a copy with potentially much less hassle. Sorry for the confusion and thanks again for the support. Fast-forward to 2006 and I get contacted out of the blue, by Lee Ferguson. It was a strange day because I woke up to a few e-mails and some PM’s through a website that we both frequented. I’d known of Lee for a few years already, but never had any contact with him. Until that day. He tells me he needs an inker for a creator-owned book he’s working on, and would I be interested. 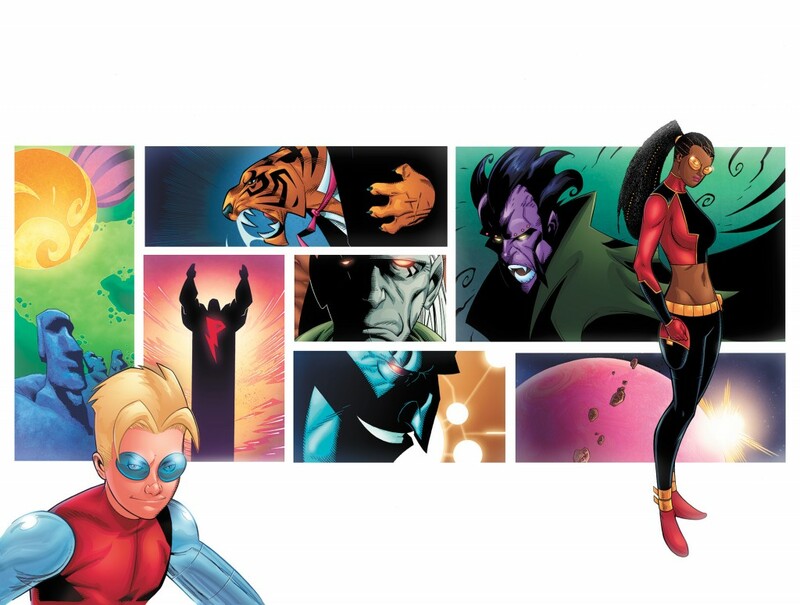 I had had my ups and downs in comics, especially creator-owned, and I was like “Sure, why not? I don’t have anything else going on.” So we got together and started exchanging e-mails, which quickly got VERY long, and went on for pages and pages. He was/is like my brother from another mother. That’s how much we have in common. So I started playing with this character with my brush and pens. Then came the hair. She has it pulled back in a ponytail, so as to keep it out of the way while “adventuring”. And I decide to take it one step further—let’s make her hair a little “nappy” as they say. My wife is African-American, and I’m sure a few of you readers know exactly what I mean, but it was important to me to get the look and feel of her hair just right. Ponytail and all. So many times in comics, characters of color are given what you might call a “black-out” feature (NO pun intended) on their hair. Usually because the people drawing them have no idea how to draw their hair, so they give it a basic shape and just fill it in black. I wanted to give it the feel and texture that’s appropriate, and even without the actual colors being laid in digitally, for you to instantly recognize that she is African-American. To get more technical with it, it’s really just me and a .13 or .25 Rotring Rapidiograph pen scribbling her hair on there, making sure of light sources, etc., but that’s about it. And sometimes, it can take an infinite amount of patience to get it all done, but I hope everyone agrees that it’s worth it in the end. I have this thought every time before I start any new script, because I enjoy torturing myself I guess, but here’s what it is…this is the most important script you’ve ever written. No pressure at all there, right? But in the case of Miranda Mercury and the Final Lesson, this lofty declaration might’ve actually been somewhat true. Much of this entire mini hinges on the pivotable first meeting between Miranda and Vega, and if it hits the wrong emotional note, everything just unravels. Jack’s motivation isn’t nearly as strong, Miranda’s shame isn’t as justified, etc. On top of that, I’m always very cognizant of the somewhat suspect portrayal of female superheroes in comic books. I’d already made what I thought was a fairly overt “statement” in #297 about how even the implication of excessive violence and/or sexual exploitation towards our female characters would be handled, so any time I have to do something awful to Miranda, I’m always mindful that it has to be done in a respectful way. So after coming off the “torture issue,” I was lost in the notes for this one for a long time. The major beats and dramatic turns have been in my head forever, and I’ve literally waited years to type the lines, “I don’t give a damn what you’re granddaddy says—you’re a Mercury woman. No limits.” But still, there was something important missing, an element or turn that the whole thing was lacking. Finally it came to me…Miranda, in a moment of defining youthful and willful arrogance, submits to her strange captor and his strange, mind-altering drugs, confident that she can ultimately handle anything he dishes out, because well…because that’s how it’s always been for her. Since she was 10 years old. But this turns out to be the worst mistake of her young life, and an event that starts a chain reaction that changes almost every aspect of her existence. But it was something that I felt was human and believable, the kind of rash decision that we’ve all made sometime in our ever so righteous youth, so sure we already know everything there is to know about everything. I felt this turn ultimately didn’t diminish the strength of her character, and turn her into the kind of female victim that I’m sick to death of seeing in comics, movies, etc., and that she was created to rebel against. In this respect though, she is a victim, but she’s also a participant, and this fact only amplifies the sense of guilt, anger, and shame that washes over her anytime she faces Vega. And Jack Warning being the only other person that knows what really happened in that room makes their friendship that much more important and essential to everything that comes next. Brandon Thomas: Trying to pick a “favorite” piece of artwork from this book is pretty impossible. But anytime somebody brings it up, one of the first things that comes to mind is what we started calling the “super spread” from issue 297. This two-page spread, which already had to be laid out with the action going right to left and upside down, took Lee several days to draw and really did make me feel like a bit of a jerk. See, we’ve got this running joke that every issue I have to ask him to draw something that causes him to reflexively wish that I have my hands broken. This was definitely that moment from #297 and amazed as I was by the final result, I was also struck by another very strong emotion…guilt. Lee Ferguson: #297 was a tough issue for me, personally. Near the end of drawing #296, my grandmother was diagnosed with pancreatic cancer, and before I’d even gotten too deep into #297… she was gone. It was a tough time, and it seems, looking back, that my response was to throw myself into the work. I guess that’s how artists cope, I don’t know. 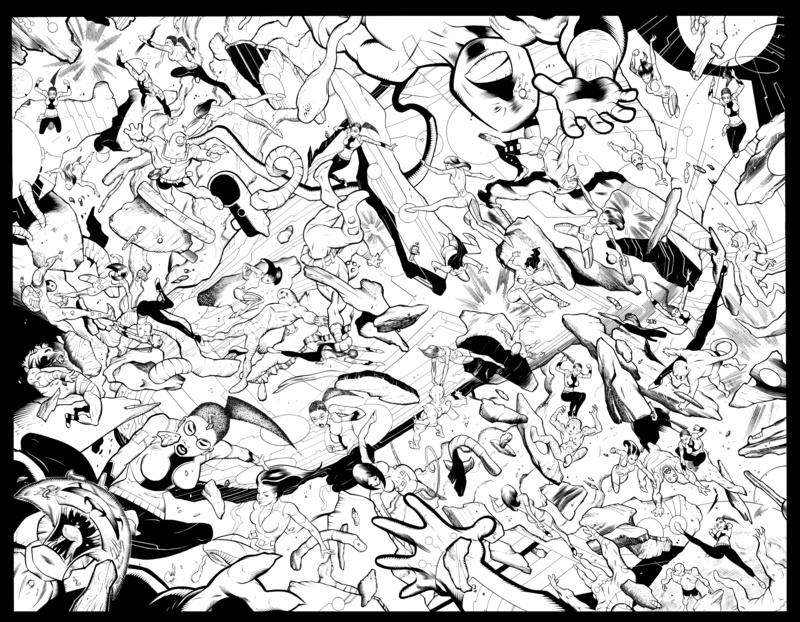 But this was a really tricky issue to draw—looking back, I wish I’d settled on the grid format that I’ve been using so much in the later issues (it would have made those missing panels more effective)…but overall, this is the first issue of MM where I really felt like maybe, just maybe, I was going to get this right at some point. This is probably a good time to mention just what it’s like working with Brandon. The toughest thing about this project, for me, has simply been trying to live up to Brandon’s scripts. I don’t mean that as anything but the honest truth, either. These scripts all present different challenges, some of which I feel like I did a pretty good job with, others…where I’m pretty sure that I fell short. But they always challenged me in multiple ways, and I always had to force myself to learn something new simply to be able to pull off what the page required. 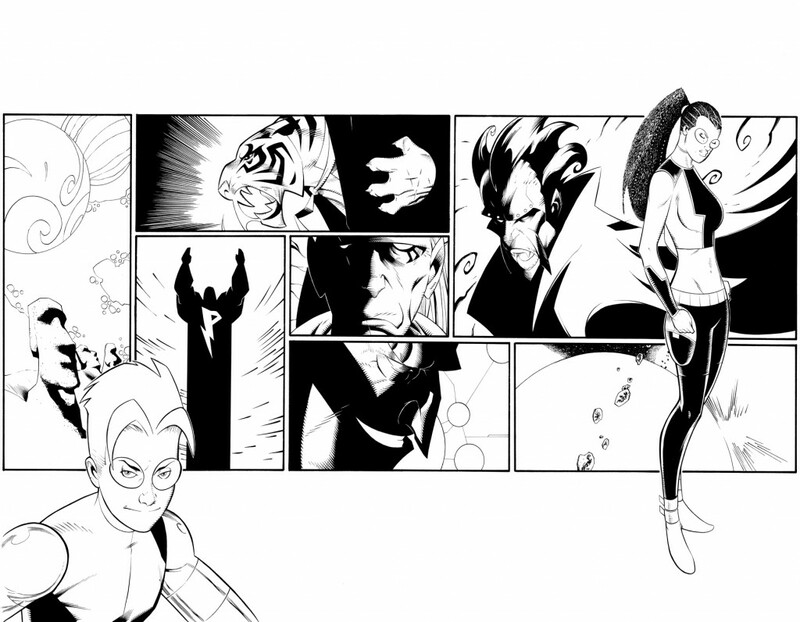 I’ve never had so much fun drawing comic books. 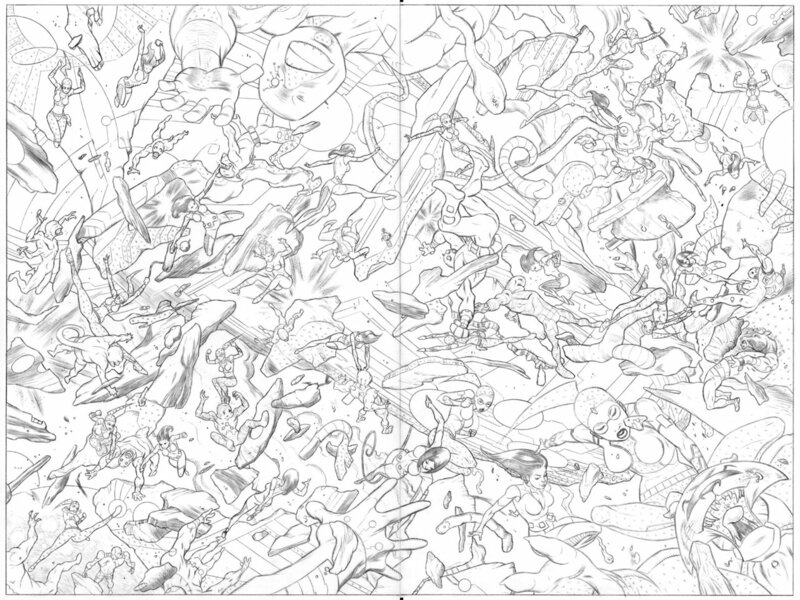 Of course, then there’s the spread for #297…yeah, I really don’t know what’s wrong with me. 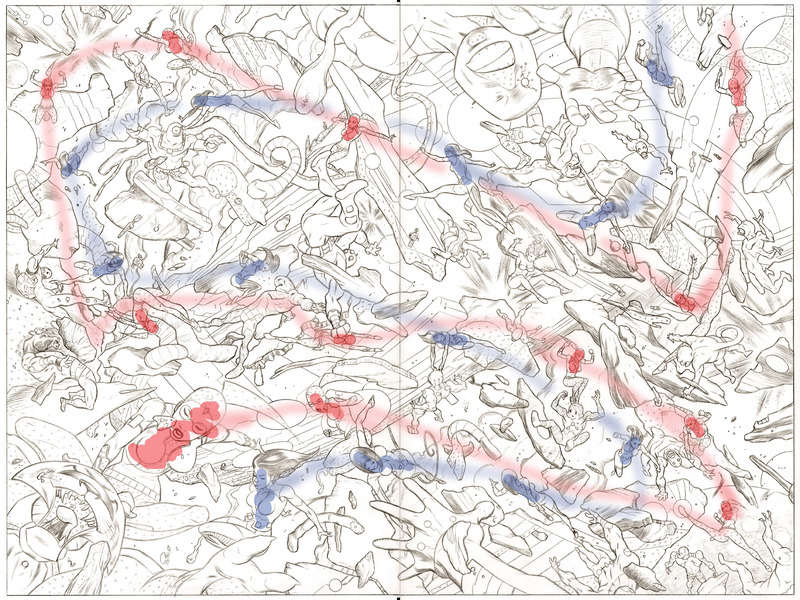 I’m always wanting to get faster, trying to find ways to streamline my process…and then stuff like this happens. I dunno, I just go with it. I started planning the thing out, and it seemed we needed more and more figures in there to carry the motion back and forth, and it kind of took on a life of its’ own from there. I think I could do a better job on the piece, now, but it’s still a pretty big, crazy, only-in-a-Miranda Mercury-comic moment that I love. 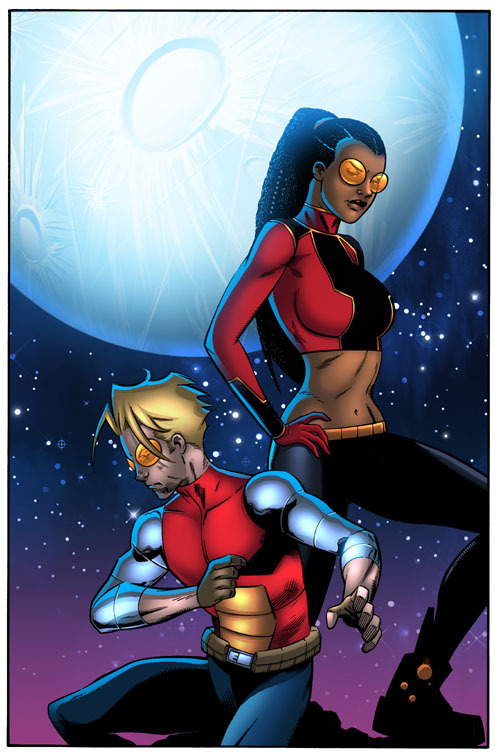 And to that end, this is another example of our inker and various colorists backing me up. It’s one thing for me to take something Brandon drops in a script and run with it like I tend to do, but it’s a whole different thing for me to dump this sort of thing on the next guy in line. Sure, I got a few death threats from time to time, but it was always in good fun. At least, that’s what they say. But the crew always buckled their chinstraps and went after it, and for that I am grateful. 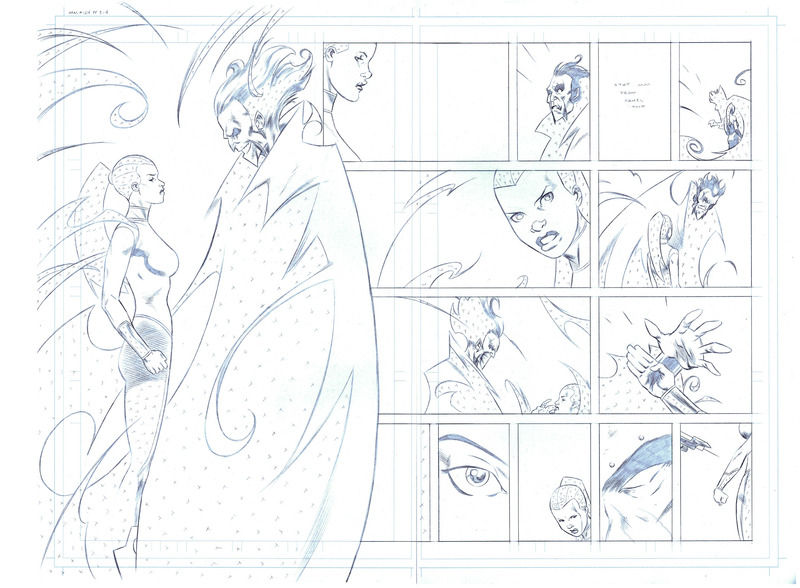 (1) Double page splash. Welcome to Mid-Air Combat, gentlemen. We got a very brief glimpse of this earlier, when Miranda was taking down the last of the Suiciders, but this right here is the pure unadulterated visual representation of Carlita Crane’s secret fighting art. The sound of course is the result of Jack Warning wiring the building’s floors to explode with that necklace of thermal detonators he was sporting a couple pages back. Which means the floor has given out and everyone on the last page is in complete free fall, plummeting twenty stories to the bottom floor the hard way. So yeah, the bad guys have screwed up. Think of Crouching Tiger, Hidden Dragon here, where the characters effortlessly leaped from tree branch to tree branch, only in this case, Miranda and Carlita are hopping from opponent to opponent, violently taking them out in the process. The backdrop of this moment is pure chaos, bodies and debris raining to the ground, gravity holding them within her sudden grip. Miranda and Carlita are the only things that make absolute sense in this shot, the women gliding through the concrete and the glass with relative ease and definite purpose as they pound the crap out of a roomful of bad guys that actually thought they stood a chance against them. But yeah, this should be what happens when two badass female heroes team up to bash the heads in of people that can’t wait to capture them and fit them with gravity anchors. In the world of Miranda Mercury, even implied violence against women will be severely punished, and as beautiful as this is, it’s also a bit brutal—Carlita taking Miranda’s blessing to heart and breaking legs, smashing noses, snapping bones, etc. Like I said…they really messed up this time. Thanks to some last minute wrangling by Archaia Publisher Mike Kennedy, I have a couple boxes of Miranda Mercury HCs for this weekend’s Wizard World Chicago convention. I’m splitting a table with recent Kubert School grad Craig Cermak, who is a fantastic young artist and colorist that I’ve known for years now and who just happened to color issue #299 of the hardcover. Please drop by table #3122 in Artist’s Alley and say hello…and you know, buy a copy of the hardcover if so inclined. Should also have some posters, bookmarks, and limited edition bookplates as well. 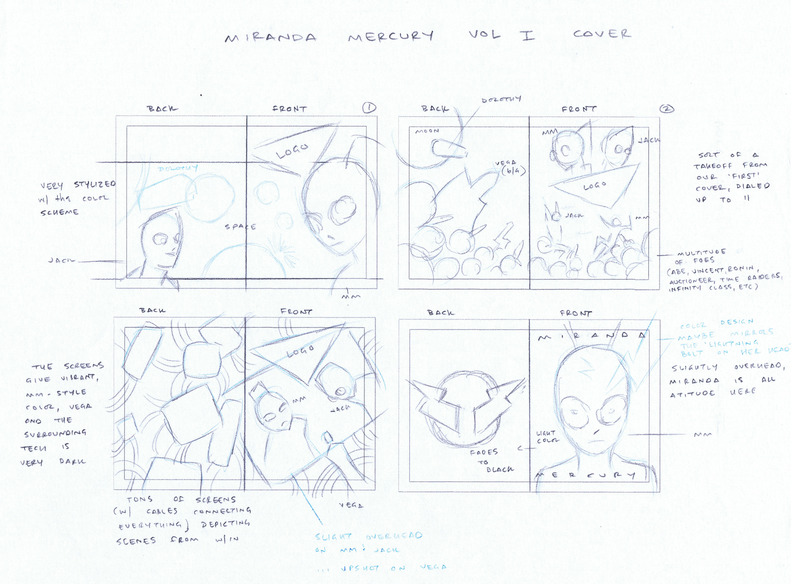 The Many Adventures of Miranda Mercury has appropriately had many different covers during its lengthy production cycle. 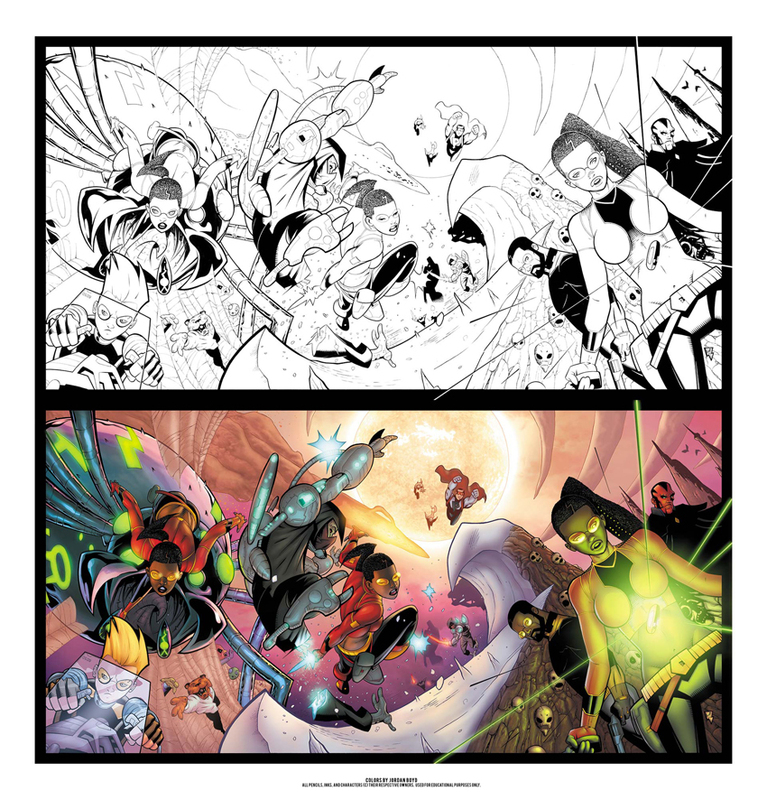 The image that appears on the published version of the hardcover is actually an interior page which occurs at a pivotal point during the book, and we decided that it offered a more editorial/interesting piece of artwork that sidesteps the usual “main characters starting coolly at camera” thing so common in…well, everything really. And we’ve done that ourselves a time or two, so hopefully this will be a breath of fresh air and stand out a little more on the various stands and bookshelves. Though the glorious spot varnish should help with that too. But since we’re on the verge of a wider release—thought it might be fun to pull the curtain back a bit and show everyone some of the things that almost made the final cut. 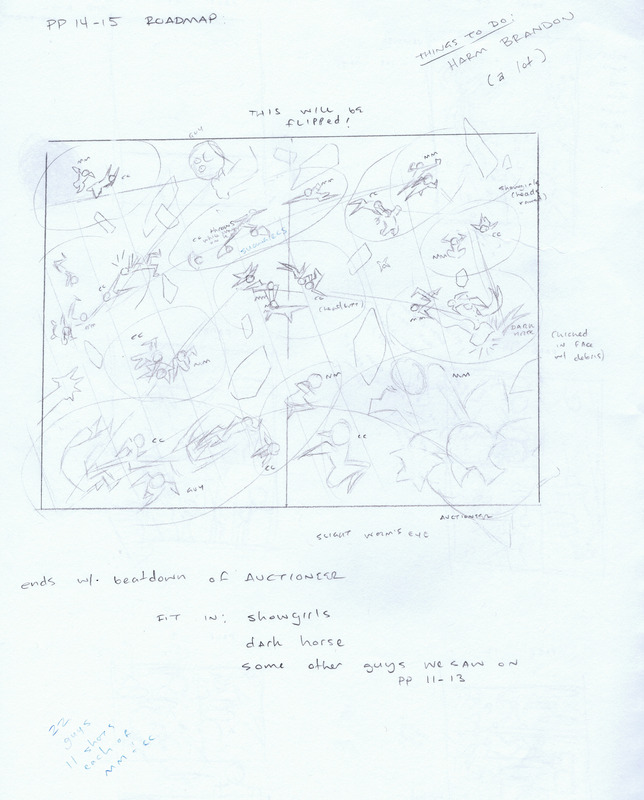 Let’s start off with some of the initial sketches and layouts that Lee cooked up when we were trying to decide exactly which direction to go. One theme you’ll notice in almost all of these are the wraparound covers, which I freely admit to being fairly obsessed with. Ultimately, what we used almost counts as one but if we have the opportunity to continue, it’s a pretty safe bet you’ll see more of them in the future. 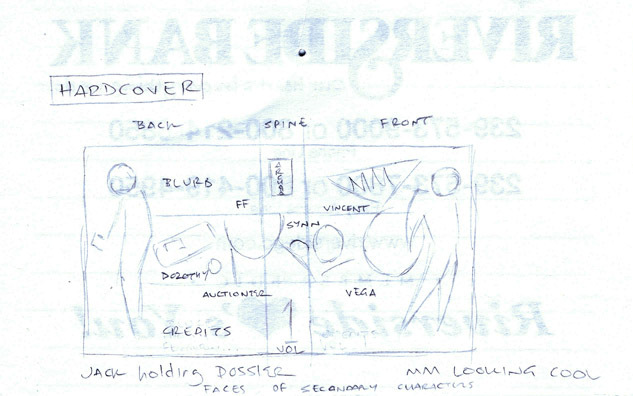 This is what we settled on for awhile and it was the image that went out with the initial solicitations. 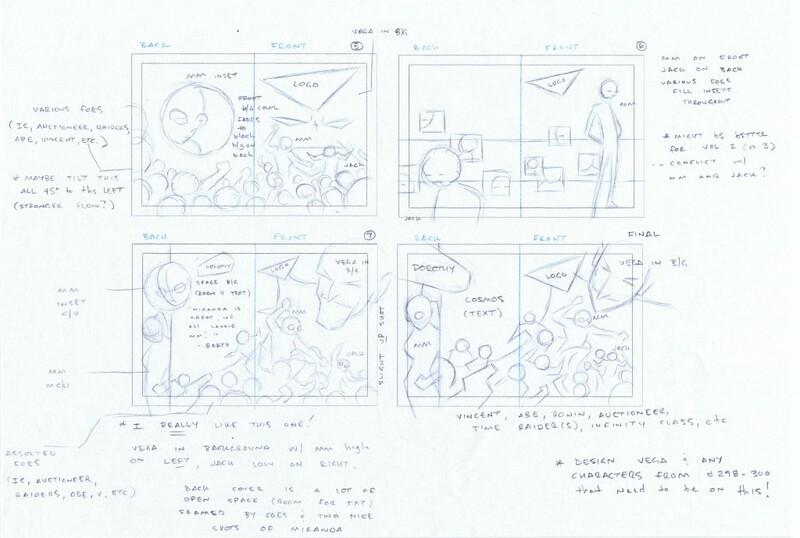 Think it blends a few of the stronger elements from a couple of the initial layouts, but the more Lee looked at it, the more he disliked it and so we and Archaia started to discuss other options the closer we got to finalizing everything. Our first instinct was to repurpose this nice image of Miranda and Jack which we did for promotional purposes, but it didn’t work when mocked up and it was already on the front casewrap of the book. After a few days of discussion, Scott Newman, who is Archaia’s production man extraordinaire, suggested the current version and Lee absolutely loved it on sight. I needed some convincing but seeing the whole thing all done up with the spot varnish and finishing touches makes me a true believer. Yet another remainder that I’m not always (or even often) right and it was a great call. For a while, the series was going to release as three oversized issues and so because of our previously mentioned fascination with wraparounds, we thought doing a triptych cover would be a lot of fun. 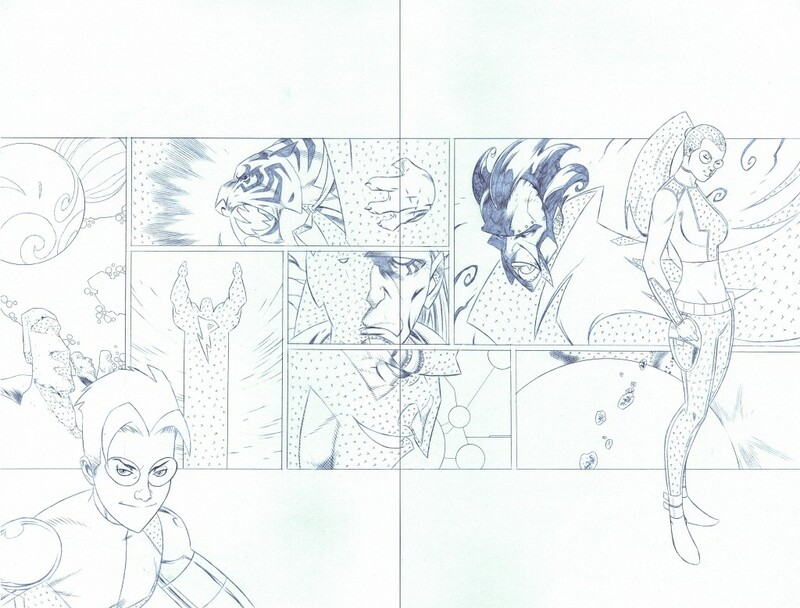 Don’t know if Lee agrees, but I love the artwork on this piece, even though it uses preliminary designs for Vega and James that ended up tweaked in the final version. 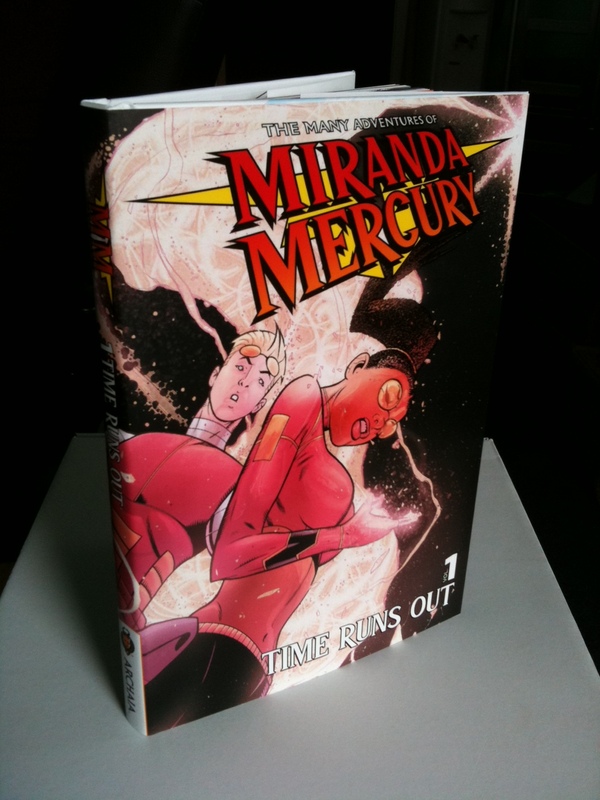 So the Miranda Mercury hardcover makes its grand debut this Wednesday at San Diego Comic-Con and I’ll be at the Archaia booth(s) signing all weekend long. We’ll have an extremely limited number of advance copies (200) and my goal is to blow through them as quickly and as decisively as possible. To facilitate and publicize this occasion, which would undoubtably be a huge personal and professional moment for me even if I didn’t move a single copy, I’ll be using the Miranda twitter feed and my personal Facebook page to provide as many real time updates as I can. Hopefully not too many, cause I have books to sign and people to meet, but be warned that my status updates will likely be coming fast and furious all weekend. Presumably counting off the first 200 copies of the Miranda hardcover to get into people’s hands. Full signing schedule is posted below and let’s come out the gate strong! All signings are at booth #2635 unless otherwise indicated. Thanks again to everyone for your continued support, but special shout out to the rest of my creative team–Lee Ferguson, Marc Deering, Matty Ryan, Felix Serrano, Jordan Boyd, Craig Cermak, and James Brown.